I'm celebrating today. I have just received the first copy of the reprint of my sister’s book. This means that at least one of my projects has come to fruition this year. The first two small print runs had sold out and there were still some outstanding requests, but my sister hasn’t been in the best of health lately and couldn’t do it herself. It was supposed to be really easy. Sabi deserves loads of credit for getting it out there in the first place, but best of all, it can now be bought through almost any bookshop anywhere in the world and can also be ordered online via Amazon, Booktopia, The Book Depository and possibly even this blog, when I work out how to put the widget on. Copies of the book are also available in several libraries, especially around Melbourne, at the Immigration Museum and in some University German Departments. I am talking about the English version here. The German version published by Verlag Sindlinger -Burchartz* was released in April.The difference in price is because the English version has some colour illustrations, in case you were wondering. So what is this book about and why does it matter? On the surface “A Life in Two Suitcases” is a simple story lovingly pieced together from fragments, diary entries, letters and my sister’s recollections of our mother’s life. Gundel’s cultured, middle class life in southern Germany is shattered as Hitler rises to power. She is expelled from school for writing an anti -fascist essay, some of her family members are forced to flee and neither of her parents survive the war. As peace returns, she is at last able to marry and she and her husband begin to eke out a modest living. However, after another personal tragedy, she is persuaded to seek a new life Australia, though this does not prove to be the utopia she imagined. Fortunately she eventually comes to appreciate those wide open spaces, and there are also some lighter moments, but that’s all I'm going to tell you for now. This book is not perfect in every way. The poetry sounds very stilted in English, some of the pictures could be better. 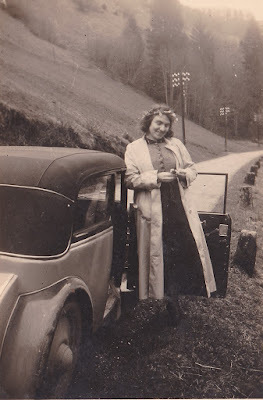 I even disagree with some of the things my sister wrote - for instance Dad's car was not a Hillman, but a maroon gangster saloon with big running boards, and there were no plastic bottles in the 50's, but it doesn't change the substance of the story. It is about real people and real lives. It's significance lies in the fact that it gives a voice to the experience of many of those Post World War II migrants for whom coming to Australia was not necessarily the universal success story which almost everyone now seems to claim. For example, Dr John Hirst, Emeritus Scholar, School of Historical and European Studies, at La Trobe University, writing in The Conversation in 2014, began by saying, “Let’s admit it, Post War Immigration was a success “ simply because most migrants did eventually end up owning a home and their children usually did well. However, this glosses over the fact that it was not always a happy experience for everyone. To his credit Peter Mares in "Not Quite Australian" 2016:16)** mentions the bullying, taunts, social exclusion and social stratification, though at least there was no overt persecution. A Greek friend, who came to Australia at around the same time as we did, says her mother cried every day. Large numbers, around 10% returned to their homeland when this became possible due to growing affluence and the advent of cheap airfares. In Gundel’s time, that was an impossible dream. Why does this matter 50 or 60 years later? As Barbara Roche, the UK’s former Minister for Immigration and now Chair of Trustees of Britain’s recently opened National Immigration Museum, explained at its opening in 2017. “…personal stories (are also) national stories; all our stories,” and a way of exploring our history. The same could be said of Australia too, although Melbourne did get its Immigration Museum in 1998. No -one wants a pity party, nor was it all bad, but we shouldn't airbrush the stories of quite a large number of people and a particular period out of our history either, as we used to do with aboriginal history and convict history. I like to think Australia has grown up a lot since those times, and that this book will help to fill in that void. Alas, the people who would have appreciated it the most, have largely left the stage, but it will resonate with their families and anyone who has had to make a new life in a distant country. The people who should read it, are those who have stayed comfortably at home. As new waves of migrants sweep the world and we now embrace sushi, burritos, laksa and Rogan Josh, it might be worth pausing for a moment while sipping that latte, or that nice little drop of Merlot or Chardonnay, or even while eating your muesli or yoghurt, to drink a little toast to those pioneers and say a silent thank you. A big thank you also to all the people who have helped me with this project over the last couple of months, especially Scott Jones at the Waratah Group, Jacinta at Focal Press, the many people I have badgered at Ingram Spark, my fabulous family and in-house IT team, and of course the lovely Michael C. who not only offered to write a program to overcome some technical issues, but provided much emotional encouragement. PS As my friend Michael pointed out, Australians may not have been terribly enthusiastic about all the newcomers, but by allowing people to come to Australia, they did save many from persecution and possible extermination. (Gundel’s family is better known in Germany, partly because of Gundel's own writing, but also because of the missionary work in India by previous generations and the connection to Herman Hesse [Winner of 1946 Nobel Prize for Literature] see for example the Herman Gundert portal at the University of Tuebingen about Gundel's great grandparents and Hesse's grandparents which will be available internationally with translations as of 20/11/2018) . ** This line is loosely borrowed from “Not Quite Australian” by Peter Mares (2016: Text Publishing, Melbourne). It talks about contemporary migration and temporary migration and how this differs from earlier periods.